Apologies for the terrible Get This “Yobbos Up The Guts” reference, but this is worth it. It’s that time of the year where the Melbourne International Comedy Festival is fast approaching. While there are many high quality and talented performers popping up in various places, here’s one for the regular site visitors. 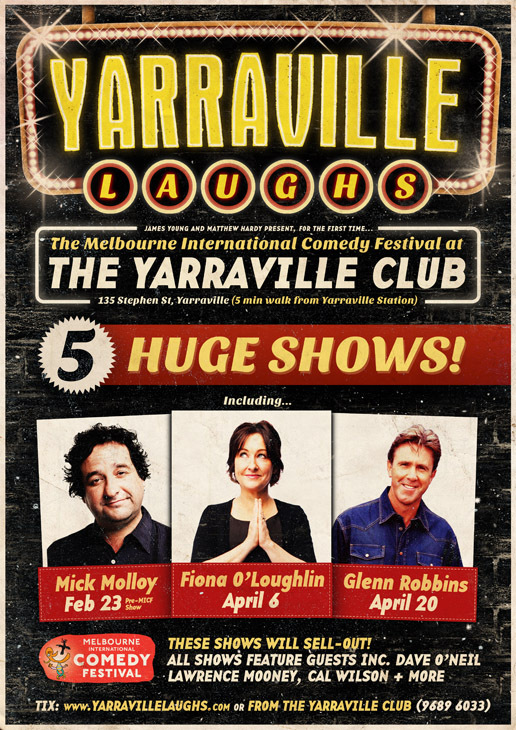 Yarraville Laughs at The Yarraville Club begins late February with a star-studded cast doing their stand-up over various nights. Mick Molloy, Glenn Robbins, Bob Franklin, Brian Nankervis, Greg Fleet and many, many more are spread over FIVE shows before, during and after the MICF – all at The Yarraville Club in Victoria.